Just a couple of days after we got wind of its release date, T-Mobile has confirmed that the LG G3 will be available to buy from its stores, and online from July 16. To be sure of being one of the first to get hold of one, you can pre-order one from today. Full retail price mentioned is $598.80 on the pre-order page. Working that out in terms of a $0 down/24 monthly payments EIP, that’s $24.95 for 24 months. Running up to this date, T-Mobile has been running an Open Beta Sweepstakes, offering the chance for people to get hold of the G3 before they hit store shelves. Over 74,000 customers entered, 28 of whom received the LG device before it was available to anyone else. 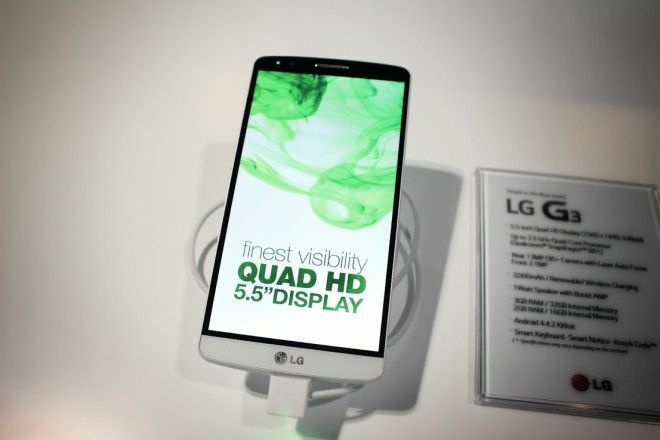 The G3 adds to an already varied range of LG devices available from T-Mobile. A lineup which includes the G-Flex, G2, Optimus L90 and F3Q. It’s equipped with an awesome 5.5-inch Quad-HD display, fantastic camera and great battery life. Having used one for the past couple of weeks, I can say it’s one of my favorite phones so far this year. It’s brilliant and you could do a lot worse than grabbing one. Having such a large, sharp display in a comparatively small chassis is amazing. Will you be picking one up? If you’re planning to, be sure to head on over to the LG G3 pre-order page on T-Mobile’s online store. What’s up with the (typo?) 2GB RAM and 32GB ROM? With a decent ROM this would be a killer phone. I hope this becomes a Nexus phone. Shouldn’t it be 3 GB of RAM? YES , It is 3gb of ram with the T-MOBILE Version! So the T-Mobile site is wrong? Yes, it’s 3GB for sure. They just need to correct it, just like how they label their LTE on that product page as “up to 42Mbps theoretical”. Yeah, Des Smith on Twitter said T-Mobile will be stocking the 32GB/3GB model. gezz that’s pretty cheap to have high end spec the note 2 retailed for 600 sumthing. This phone looks fantastic! I want to try one and see how I like it! I’ve never been a fan of these huge screens, but LG does a much better job than just about anyone else at reducing the bezel size!! Telling you, it is fantastic. I think I’m gonna publish a review here on TmoNews since Marco already covered it for PhoneDog. Looking forward to this phone. I really hope that 2gb ram is a typo. I want to see it in person before I make any decisions. Most likely I’ll get it in black though. Yeah, I’m not diggin’ the white on black look. Kinda looks lame to me. Black would be the way to go! G3 comes with 3gb it’s a typo. Full price only? No payment plans? Yeah the pre order said full price. I am just glad they are offering all 3 colors. What 3 colors are they offering? I only saw black and white. When I clicked on one of the links it said grey. The “Metallic Black” is gray. I don’t think there’s another gray option. I think they have white, gold, black (gray). Go to upgrade your phone. Tick off the LG box and it will appear. I was able to pre-order as an existing customer. Just checked my JUMP plan and LG G3 not available as a JUMP phone. Perhaps pre-order not available to JUMP customers? go into the store. they can do it. how it works though is your trade-in is done as a deferred trade-in. Once you get the g3 you’ll mail your current phone in. I called my local tmobile store. They can’t pre order it. Hmmm..I’ll check in a bit. We are sorry, our systems are currently not available. Please wait a few minutes and try again. I don’t know if any of you guys will know but I’ll ask anyway. When will Costco get the G3. No idea, sorry. I generally only get info about T-Mobile’s own plans. Third parties not so much. Wish I could help more. Cam how come us current tmo customers is not eligble to preorder via installment plan? Can u pls help us with this matter? Thanks! I just looked this morning and it’s now available online on the installment plan. No idea why it wasn’t available yesterday. Log in and check now, it should be available for you to pre-order via installment plan. No worries, Cam. I’m going to stop by Costco in a few minutes and ask. Wireless rep said on the 18 of July for Costco. It’s no cheaper than a T-Mobile Corp store but you get an accessory kit and a $25.00 Costco Cash card. Sometimes it’s $50.00. Hopefully, they’ll have a live phone at Costco, so we can check the brightness ourselves. Either there, BestBuy, or a T-Mo store. Costco got s5 same day so hopefully they get G3 same day too. Good thing I got it there as I ended up returning it. There correct. It’s full price right now. July 10th, u can pre order at store. You can’t pre order in stores. How will you make money on retail $600 phone? Why buy and resell it for cost? I wish there was a version of this model that came with a hardware keyboard. I’ll probably still get it though. As one of the lucky few people having had the device in my hands for about an hour, I must say I was impressed. The 2K screen wow-ed me. LG has stepped their game up for sure this time. I can see what all the fuss is about now. If you’re considering ordering this device go for it. Not an LG fan, but credit is given where credit is deserved. GOOD JOB LG. How’s the camera? On previous LG phones it had what people called a cartoon look. Not very crisp. TMobile updated the memory specs from 2GB to 3GB this morning! Note 4 only for me. ..Did anyone else notice that instead of a ‘front camera’ on the pre order page under specs, it says ‘selfie’? Did anybody else notice it says ‘selfie’ instead of front-facing camera under the specifications? Heads up guys, was finally able to pre-order just now on Jump Program without getting a systems unavailable error message :) ! I used my jump and pre-orderd one. Is T-Mobile carrying both the 2gb and 3 GB of ram? Because when it didn’t give be any options besides the 2 colors .